I don’t know if a church can be called charming, but if any church can be, then that would be The Church of Sta. Maria in Cosmedin. This small church is located in the Piazza della Boca della Verita, at the end of the Via Circo Massimo, and opposite the oldest marble structure in Rome, The Temple of Hercules Victor. Because of it's circular shape this structure was thought to be a Temple to Vesta, but was later determined to have been built in honor of Hercules, who as legend tells it, came to this area during the course of his 12 labors. The mistake is understandable as the grace, elegance and simplicity of this structure gives it a decidedly feminine feel. This temple is, for me, one of the most beautiful of Rome’s ancient structures. Across the street is the Church of Sta. 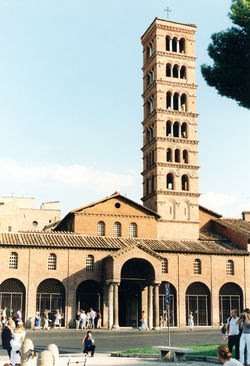 Maria in Cosmedin, a beautiful, very typical medieval basilica. Cosmedin is Greek for decoration or ornament and may have been added to the name of the church in reference to the rich decorations placed there by Pope Hadrian. A curious and charming touch is the main altar which is actually a pink ancient Roman bathtub over which can be seen a thirteenth century baldachino. The fresco on the central apse is a modern one done in medieval style, but underneath traces of the original frescoes are beginning to emerge. There are beautiful 11th century frescoes on the side altars and beautiful, cosmati mosaic floors. This church also hold the relics of St. Valentine, the saint of lovers. They honor his relics every year with a procession on St. Valentine's Day. ﻿On the left side of the main altar is a staircase leading to Hadrian’s crypt found underneath the basilica. This was built by Pope Hadrian (772-795) to house the many relics he had taken from the catacombs. What was once the sacristy is now a crowded bookstore. And in here one finds one of the main treasures of this church, an 8th century mosaic of the Holy Family, part of the giant mosaic commissioned by Pope John VII for the St. Peter’s Basilica. Most people who visit this church actually come to see and put their hands through the Boca de Veritas, (found in the side of the church) an ancient manhole cover that was known as a “lie detector” since the middle ages. Legend says that anyone who told a lie when one’s hand was in the mouth of the sculpture, would have it bitten off. There are always long lines of people waiting to prove that they are not liars. 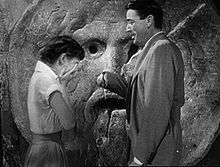 A scene from the movie A Roman Holiday, one of those truly memorable movie moments, shows Gregory Peck holding out his arm (without his hand) to Audrey Hepburn. When I entered The Church of San Stefano Rotonda for the first time, I did not know what to think about this round church, an ancient structure built in 460 AD ﻿and dedicated to St. Stephen, the Catholic Church's first martyr. This Church is the first in Rome to have a circular plan, inspired by the Church of the Holy Sepulcher in Jerusalem. At first sight, it is quite impressive especially when you walk into its wide circular space. Then you notice the new ceiling, which is lined by wooden slats and is incongrous with its marble surroundings. In addition it appears to be sagging in on the structure. ﻿ It's four chapels form a circular cross, its interior is composed of two concentric circles and its twenty two windows on top of the nave give the magnificent circular space a dramatic cast. In spite of the general beauty of its architecture, it's general atmosphere, is not conducive to prayer. The bizarre character of this church lies in the series of frescoes on the walls of the outer circle showing stomach turning scenes of various saints being martyred. There are scenes of impalement, beheadings, boiling in oil, disembowelments, hangings, crucifixions, drawing and quarterings, being fed to wild beasts and many more. These thirty four frescoes were commissioned by Gregory XIII. Underneath each is an explanation of the method of martyrdom and the name of the emperor who ordered the execution. The impact of these frescoes are quite disturbing. Charles Dickens visited this church in 1845 and had this to say, "such a panorama of horror and butchery no man could imagine in his sleep, tough he were to eat a whole pig, raw for supper". I walked around the church taking in these scenes of horror, feeling like I was walking around a Chamber of Horrors. After viewing these frescoes, I decided that the magnificence of the structure was overshadowed by the disturbing frescoes lining its walls. I left feeling decidedly chilled and wondering how many people could actually worship in this place.